This was my favourite. A very addictive snack that combines the salty-savoury tuna with fluffy mashed potato in a crisp shell. The recipe is quite simple. The secret ingredient is curry leaf which imparts a distinct aroma to elevate this simple snack into something a little more sophisticated. Chop onions, baby green chillis and a generous handful of curry leaves. Boil and mash some potatoes. Drain tuna from can. In a saucepan, saute the aromatics. Grind black pepper onto potatoes and add to the pan. The tuna goes in too. Season and mix well. Sprinke some breadcrumbs at the end. Let the mixture cool. Honestly I would have been happy to stop here. When the mixture is cool, roll it up with the hands into little bite-sized balls. Dip into beaten egg and then breadcrumbs. Deepfry. This reminds me very much of the malay snack cucur udang. It combines a simple batter and chopped fresh prawns. Take 1.5 kg of fresh prawns, yep that's quite a lot of prawns, yum yum. Peel and chop the prawn meat. Mix into a batter of flour and water together with plenty of chopped onions and baby green chillies. Deep fry and serve. These snacks go well with chilli sauce. Champa also whizzed a green sauce by combining yoghurt, coriander, chilli, salt and lemon juice together; this sauce was especially lovely with the samosas. As the sun went down, we sat around a table chatting, eating and drinking. The family cats couldn't contain their curiosity and came down to join us. We left M & J's home with three versatile recipes in our minds and memories of a laughter and food-filled afternoon. When David of A Banana in Australia tagged me to this cooking meme, I was thinking, Oh No! I am no good with memes. Everyone knows I am an imposter at cooking. My vino friends sigh that I still cannot differentiate left from right or old from new. I am also not the type to do personality tests to check which kitchen condiment I closely resemble. But, well, turns out this meme is right up my street. It allows me to do my favourite thing which is to blabber and wax nostalgic about my younger days. It was started by Nicky of Delicious Days . Cooking: I was about 9, I think. Instead of studying, especially if the subject was Mandarin or Math, I would hang around the kitchen. To observe Chan-Che peeling prawns, cleaning chicken kidneys, cooking dinner, making rempah; sometimes I asked questions and sometimes she assigned me simple chores like cutting cucumbers or beating eggs. Sometimes she would throw in small wisdoms that still float in my head, like" never add water when frying kangkong, or only salt the fish moments before frying"
Eventually Chan-Che let me fry a whole egg by myself. Then I graduated to roasting peanuts in the wok. Once or twice I fried rice for our lunch. Baking: That would be at Marymount Convent School, where I made Rock Cakes-recipe in our Home Economics text book which comes after Tea / Coffee. I was 13 then and it was my first time using an oven. Before then, we had an oven in the house but neither Chan-Che nor Mummy knew how to bake. So the oven was more an object of curiousity, we opened the glass doors to hear the metallic echo, and sometimes stored our toys and books inside. At first I thought of Chan-Che, but later I remember that I only seriously started cooking when I went to study in London. The main person who guided me was my aunt L.
We call L aunt even though she is close to our age, about 5-6 years older than us- because her father is my grandfather and her mother is my grandfather's third wife. I credit L with opening my eyes and palate to foods I would never have discovered on my own. Aunt L has her own family to look after now, but back in London almost 20 years ago she was also our surrogate-mother figure, looking after me, her younger siblings and other cousins. I first arrived in London a week before Christmas. L made the roast goose, a large platter of lamb chops and helped grandmother make some chicken curry for the Christmas Day feast. That set the standard. Pretty soon it was my turn to cook. My cousins helped me to make spaghetti bolognaise with minced beef and tonnes of vegetables, no recipes, we threw everything in the pot and boiled them well. When it was served, all the meat had melted and disappeared. Obviously there was room for improvement. L is not really the best cook I know, but she was adventurous and really loved cooking elaborate meals for us. She didn't have many cookbooks but what she had, she used extensively. The Yan-Kit So cookbook which was our bible, sometimes Ken Lo contributed a recipe. A thick book on classic English foods, though we ignored those recipes that instructed boiling the meat. She shared tips she learnt from going to cordon bleu classes, I learnt what is shortening, and ventured to make my first quiche, first custard, first shepherd's pie. We were always cooking, it could be creme caramel, or her mum's special siew yoke. So, yes, L. While Chan-Che dispelled any fears of entering the kitchen, I have L to thank for encouraging my curiosity and for being around at a time when I either could learn to cook and eat well, or be lost and subsist on instant noodles and institution food like some of my university mates. No. Our family had one camera and it stayed in its special box most of its life. Photo studios are places one go to to have pictures taken. Not really, but recently I've had some disasters with making zhong nai- a milk pudding set with ginger juice. Most valued: The wok. It steams, fries, boils, smokes and roast. Biggest letdown: The mezzaluna mincing knife I bought when we honeymooned in Paris. The cleaver does a better job. Only when I am not feeling well: cut-up overcooked ramen in canned mushroom soup. Fu yu (fermented bean curd) mashed with rice wine, sugar, sesame oil. Minced parsley (loads of it), scallions, chilli and anchovies, mashed and bound with olive oil. A versatile sauce to go with boiled vegetables, fish or pasta. I know many people who hates parsley and anchovies. 1. Rice and by-products: I need rice fix at least every three days. Fine beehoon every week. 3. Roast duck. Crispy aromatic duck. Duck with sour plum sauce. Assam duck. Erm, duck. You will probably never eat… dog meat. Your own signature dish… stir-fried chilli-shrimp eggplant. When we told M & J that we loved the party snacks they served at their home and one of us asked about the recipe, M graciously allowed us to invade her kitchen and watch them goodies being made. We were introduced to their wonderful helper who led the class. This pretty lady is Champa, she comes from Sri Lanka and is very shy and soft-spoken. She patiently took us through the steps and did all the work while we asked silly questions and escaped from the hot wok when the heat got too much. I cannot remember the exact quantities, our other friends were the ones taking down detailed notes and filming the whole thing in video. My narrative is less structured, figuring we can always improvise at home. We learnt to make three items. Take some big red onions. Chop finely. Do the same with baby green chillies. Have on hand mashed potatoes and minced chicken. Heat oil in a deep pan. Saute the onions and chilli, add the chicken and stir through till partly cooked. Now the potatoes. Seasonings was Champa's secret masala blend and chilli powder. Finally, some green peas for little bursts of sweetness. Remove from pan and set aside. 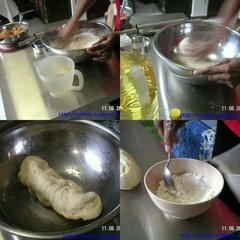 Make the pastry: Involves flour, water and a touch of oil. Knead till done. Make a little slurry of flour and water. This is for sealing the samosas later. Roll the dough out thinly. French rolling pin optional. Cut into discs, then halve them. To make cone, dab slurry on one side (see bottom left picture), then fold the other end over and seal. Yes, I have plump hands and fat fingers. I was also wearing my strawberry T-shirt that day. Then if you are Champa, you do the "twirl"; it makes a nicer cone. Stuff as much as you can of the fillings. Seal the edges with slurry. Crimp with fork, or do the curry puff finger crimping thing if you know how (me! me!). More hands make light work obviously. Deep fry. This dish took the longest time to make, because of the dough and the frying, but it is worth it for its homemade taste. Champa's masala blend makes this samosa special, the heat starts off gentle and mild and warms up when you get to the middle. It was even better when we toasted it some more for breakfast the next day. Next post: In Part 2, we will discover more recipe ideas that also involve potatoes, onions and baby green chillies. My dedicated makan friends M&F have sussed out all the good eats in the Joo Chiat/ Katong /Geylang foodie hot spot. For a recent weekend meet-up, they brought along two boxes of what I reckoned are the best curry puff in Singapore. The sardine puffs were especially commendable,generous of sardine instead of the usual onions, with a curry that tasted like somebody created a special blend just for it. The regular curry puffs also has its customised spice mix, and you can actually see pieces of chicken. Curious about Rufus, our other pet? Click here. Some messy pictures of meals eaten with family. Second sister has given birth to her third child, so that makes me aunt to a total 2 nieces and 3 nephews. The children are growing up quick and developing their personalities and quirks. Her eldest son M, age 4, says the most amazing things. On the rather long walk from the carpark to the playground at Lake Gardens, M went philosophical on us, saying in a resigned tone, that "we'll get there when we get there". Yet when it got quite hot and sunny, he sat down at the park bench and said "I want air-con." He is also developing a sophisticated palate, preferring block cheese to Krafts, and he has a thing for salamis. So the kids enjoyed udon with chicken and salami casserole for lunch, made by their doting aunt my third sister. And then there was the raucous dinner with mum, dad, my brother, his wife and their kids at a Japanese restaurant in Sri Hartamas. Now there are so many restaurants in this area which gets me confused, not to mention how frequently they come and go. So Sugimoto's must be doing something right. It is not even located on the ground level and yet it was full on the Monday night we visited. Their menu is wide ranging, one can get sushi, sukiyaki and more modern fusion type dishes. Some dishes were a little over-salted and messy but there were some tasty dishes too. Vigra rolls, not sure if it was meant to spell that way, have loads of avocado strips on top which won over everybody. Spaghetti mentaiko was superb with plentiful amount of the spicy cod roe. My little nephew was very naughty and noisy, so I called him Denise (after the Menace). His father, i.e my brother was not amused. Anyway we ordered a vast amount of food and went home with protruding bellies. Finally saw Sepet. A sweet and unpretentious movie dealing with a potentially touching subject. But the ending sucked. It has Harith Iskander in it, never a bad thing, but his role in the movie was kept very low-key. There were two songs in the movie which I discovered I liked very much, turned out they were by Sam Hui; ignoramus me is not familiar with his songs which was a pity because he is really talented, his lyrics deep yet not preachy, funny and thought-provoking too. To make up for lost time, husband bought me the double-CD of his greatest hits. I am learning how to sing Long Ji, Sam Sing. Went shopping and discovered a new snack. These traditional handmade Japanese crackers embedded with nuts (pistachio, cashew, walnuts or macadamia - my favourite is pistachio) are snappy-crunchy-yummy. A little expensive but it is Japanese, see. At the Isetan supermarket, 3rd Flr, KLCC shopping centre. KL is finally coming into its own and I am really pleased about it. It used to be that friends and relatives come to Singapore and get a bit awed by our seeming trendiness- the shopping is supposed to be better, we are soo hi-tech, also can catch mega- musicals at the durian, Breadtalk. Of late the tide has been somewhat reversed. For one thing, their TV seems better- Astro's remote-controlled TV guide was in place long before SCV revamped theirs, and their run of Jewel in The Palace was finished while SCV is only showing it here next month. Their economy looks a little more robust. Lots of tourists, especially the freely-spending Middle-Easterners. The property market is still quite hot especially in the serviced apartment sector. Their newspapers are better. The Edge beats our Business Times flat out and it even comes with colour supplements at the weekends. The Star feels a little tabloid-y but it compensates with its thickness. And I can only guess that the Chinese papers are full of insighful writings and bursting with latest news, because people even go out especially to buy the evening editions. Food is another example. RotiBoy of course. The Japanese nut crackers which Singaporeans remain ignorant of. And that to die for roast duck in PJ that my colleagues cannot stop going on about. Restaurant trends are evolving at a dizzying speed- Shangainese, Arabic, kopitiam, Penang, cha charn tng. In less than 4 months One Bangsar has sprouted a brave colony of trendy dining spot, similar outposts were spotted in town. Most of the new places would be more good looking than good tasting, e.g. picture above was of a salad of young jackfruit served at Cungdinh at One Bangsar. The salad tasted fine, but the other dishes we sampled did not really rise above average. But after that lunch I could still go across and buy cucur udang for 40 cents a piece from the makcik across the street. The prawn fritters were bathed, no, flooded with plenty of lipsmacking enak chilli sauce whick soaks into the delicious fried dough to imbue it with more deliciousness, the whole treat just as satisfying as I remember from my childhood days. The atmosphere in KL is different too. It has a little more purpose and confidence, minus the stress factor. People do not seem so obsessed with being seen in the right clothes or toting the latest gadgets. Not like the locals are ulu, many high street names are in town. They do know how to pamper themselves, some of the malls have dress designer shops and cigar purveyors and even art galleries. My regular manicurist has been lured to KL to help her friend set up a nail studio in Bukit Bintang Plaza. I could not get an appointment with her in Singapore so I went to have my nails done at her KL place. She was supposed to stay till she has trained a team of people to do the job, and then return to Singapore where she still maintains her own business. But while talking to her, all I heard from her was how much she likes being in KL and how convenient and cheap everything is. People are so nice, workers have very good attitudes, and the food,wow. I asked her, so when are you planning to come back to Singapore, because if she doesn't who can I trust with my nails right, and she went a little sheepish on me and didn't answer me just kept erming- and -hmning, turned out she has been seriously considering uprooting her life in Singapore and starting anew in KL. That made me envy her quite a bit and wished I could do the same. Life in Malaysia seems more pleasant, especially when contemplated from the comfortable lounger in the cool white space of the nail studio. I am not much of a social commentator but I do get fed up of life in Singapore. For example, I am irked that just because traffic is bad, they raise ERP charges. Apparently motorists like myself deliberately use the roads and cause traffic jams. It is not because I need to go home after a long day at the office. Is this type of arrogance better than the inept ways of their Malaysian counterparts? At least in Malaysia people get left alone. No ERP, therefore no one knows that you went to Kajang to visit your mistress/geomancer/ favourite satay stall. In Malaysia they have tollbooths too, but mostly at newly built roads, not the main expressways. If you graduated overseas and did not return to the motherland, you don't get labelled quitter. Sometimes I check myself, in case whatever I am doing can get me fined or worse. It is not that it is easier in Malaysia but over there, people just deal with it (watching a bit too much West Wing), whatever the problem, they don't whine and expect the government to solve their problem and in return the government doesn't bother them much. Here the government cannot even trust its people to cross the street. It isn't that I am bashing the country that has given me my husband and my career, but I wish those in public service here will stop patronising the public, stop taking the dubious moral high ground, stop reinforcing their delusions of power (fines! litigations! wishy-washy talk!) and do some actual work for the taxpayers (like me) who pay their salaries. Because this country prides itself on its meritocratic principles and never loses an opportunity to trumpet this ideology. Prove it, and maybe I will complain less. umami-mummy taught me how to wrap zhong last weekend. A good thing to learn because nowadays people just cannot be arsed to make their own anymore. Takes too much time and effort. Click here for some folk story about zhongs. First, procuring the ingredients- not easily available in supermarkets or wet markets. Mummy had to ask people to buy it from dried goods wholesalers. Second, the prep takes at least two days. Cutting up the meat, washing and soaking the bamboo leaves, removing the skin from chestnuts etc. Easier if there is help, it is a lonely job picking out the jasmine rice that sometimes gets mixed into the glutinous rice. So, to the ingredients. All ready and laid out when I arrived just a little after noon. Left: Glutinous rice and mung beans. The rice has been mixed with some rough-chopped garlic and shallots.The mung beans are an essential ingredient in our family recipe- there must be lots and lots of it, definitely more than the rice. Mummy usually makes a bunch for Daddy that has extra beans. Right: Red beans and rice. Mummy is not Cantonese, so she has never quite acquired the taste for the mung bean version. She prefers red beans, there is therefore a red bean version. Next important ingredient is pork. Must be fatty pork. Seasoned with dark soy, oyster sauce, salt, pepper and sugar. A little five-spice powder too, but only a bit, because we don't really like this weird powder. Fifth brother likes his zhongs with extra pork. Right: The yolks from salted eggs. Mustn't leave this out or people will complain too. Sometimes there are two pieces inside, ooh. Other ingredients: dried shrimps, dried chestnuts lightly cooked with oyster sauce, stir-fried shitake mushrooms. The chestnuts this year was not very tasty, but the mushrooms made up for it with its distinctive fragrance and succulent chewiness. I suggested to Mummy maybe next year we should add dried scallops. I remember we had dried oyster in the recipe at some point too, but somehow it has dropped from favour. Make a pyramid pocket. If the leaf is too small, use two. The stem end should be pointing away from you- if not it will fold funny, like what happened to me. Spread rice scantily on leaf. Layer with beans and the rest of the filling ingredients. Mummy likes to layer rice-beans-filling-beans-rice, I deviate a little from this by scattering beans in between the fillings too. Everybody is scared of carbohydrates and prefer the fillings and beans anyway so there isn't much rice in each dumpling, compared with commercially available ones. I manage to get away with just 1.5-2 dessertspoons of rice per piece. Pack as much as possible. Mummy is the expert here.Just for comparison, see the picture on the right? The ones I made were in the bunch on the right. All were at least half the size of hers. Here is where the art lies. Mummy packed so much into the dumpling, but still nothing spilled out. It takes a bit of practice, especially the first fold, and it is important not to squeeze or wrap too tightly or the rice would either not be evenly cooked or leaks out during boiling. Tying is also a little tricky, but it was quite a doddle for me. My expensive education finally paid off-with the versatile surgical knot-tying skill I could tie them dumplings safe and secure. The dumplings got boiled in a big vat of salted boiling water for 2-2.5 hours depending on size. Then they cooled by the window. Dumplings ready to eat. Mung bean and red bean versions. Maternal grandma makes a gorgeous kan-sui (lye water) zhong stuffed with red bean paste, but they scheduled the wrapping on the day I went back to Singapore. Maybe there will be one or two in the freezer when I next visit. Bon appetit! Happy Dumpling eating! Mummy is making dumplings this weekend and we're going up to KL tomorrow morning to learn the family recipe. But I will miss the dogs.